This neon artwork marks a division between the Downtown East Side and the commercial and financial districts that border it. The location highlights the glaring economic disparity between neighborhoods and addresses the socio-economic, political and cultural points of disconnect. The piece calls for action, collective healing, connectivity, and inclusion. We have asked some amazing people what “Let’s Heal The Divide” means to them and you can watch their videos here. 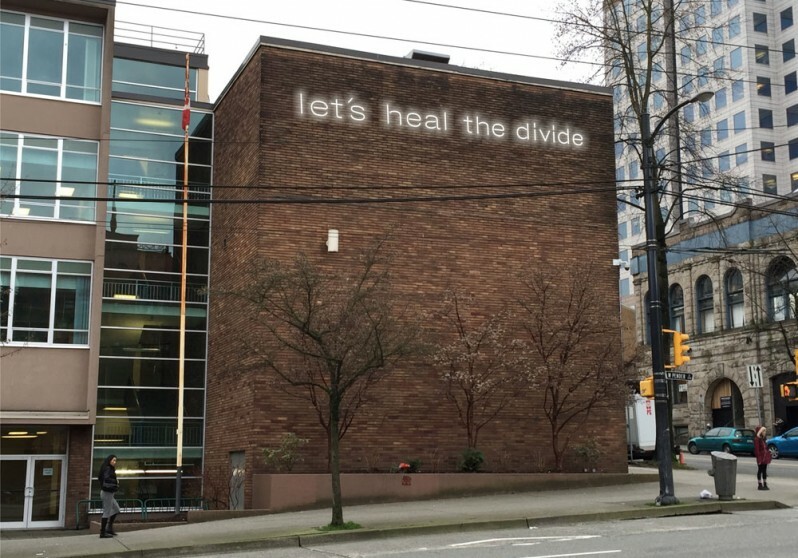 But We want to know what “Let’s Heal The Divide” means to you. Share your thoughts, photos and videos with us on social media and join important conversations about inequality in its many forms. Vancouver is located on the traditional and unceded Coast SalishTerritories of the Musqueam, Squamish and Tsleil-Waututh peoples.